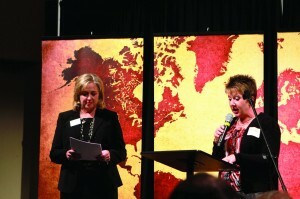 BGCO Women’s Missions and Ministries Specialist Kelly King, left, and Kayla Kelly, part of the women’s state leadership team, present the nominations for Oklahoma WMU president and recording secretary. The 2014 Missions Celebration, “Secrets to Surrender,” was held prior to the 2014 BGCO Annual Meeting, Nov. 10 at Oklahoma City, Quail Springs. The event included a testimony from an IMB missionary in a high-risk country, Oklahoma Woman’s Missionary Union (WMU) business, including the election of a new president and recording secretary and special guest National WMU President Debby Akerman. The IMB missionary shared inspiring stories of how God brought to life the Scripture, “For me, living is Christ and dying is gain” (Phil. 1:21 HCSB). 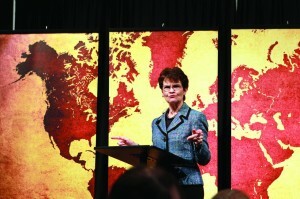 Those present were urged to continue to life up all IMB missionaries as they spread the Good News around the world. During the business session, Ellen Langland, member of Tulsa, First, was elected as Oklahoma’s WMU president, and Norma Lee, member of McAlister, First Indian, was re-elected as Oklahoma’s WMU recording secretary for her second year. Akerman gave a motivational speech about Secrets to Surrender. She challenged the audience to gain a better understanding of what surrender looks like in a Christian life. She emphasized that the totally surrendered life always points to Jesus. A personal Scripture that spoke to Akerman during her search for surrender was Num. 14:24, when God was speaking to Moses about Caleb. 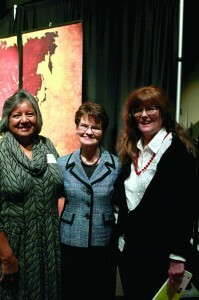 National WMU President Debby Akerman, center, with newly-elected officers Norma Lee, recording secretary, left, and Ellen Langland, president. One key, Akerman explained, was that Caleb was willing to be a minority voice in spite of great personal risk. Caleb was willing to go where it was uncomfortable and hard to follow God’s leading. Akerman described that place as Caleb’s “Samaria.” The final challenge Akerman presented was for those in attendance to think about their Samaria.